By Phil WillonJoshua Tree National Park has become a destination of taggers, and the graffiti has visitors and park officials outraged. The graffiti in Rattlesnake Canyon, which meanders for a mile through the northern edge of Joshua Tree’s Wonderland of Rocks, started with just a few markings but quickly became rampant. Vandals bragged of their handiwork on social media sites such as Facebook, attracting their like-minded friends to the same spot, paint in hand, park service officials said. 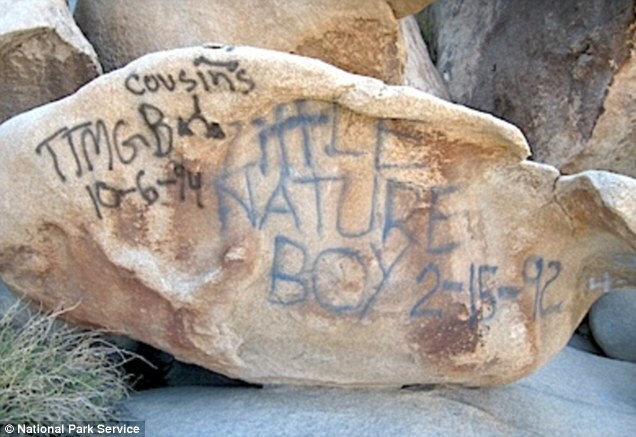 In all, 17 areas of the canyon have been defaced by graffiti, including several historic Native American cultural spots.Vandals deface million-year-old rocks in California's Joshua Tree National forcing areas to closeThe landscape is some of America's most beautiful, yet the acts of a mindless few have now spoiled the enjoyment for everyone else. Acts of graffiti have become so common at the Joshua Tree National Park's most popular hiking spots that officials have had to close them to the public, and they blame the big bump in vandalism on social media. Rangers said they've found graffiti spray painted on 17 sites, including the famous rock formations and historic Native American sites, at the Southern California park's Rattlesnake Canyon.Comment: Fortunately, it doesn't sound as though any rock art was vandalized.